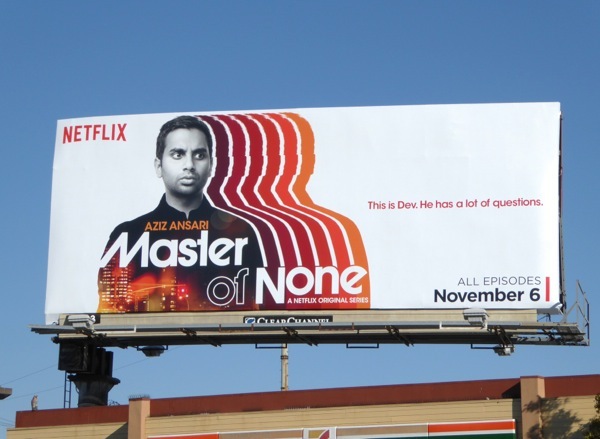 You may know him as 'Tom Haverford' from Parks and Recreation, or from his many stand-up comedy shows, but now it's time to see a different side of Aziz Ansari in his new Netflix series, Master of None. What's that saying? 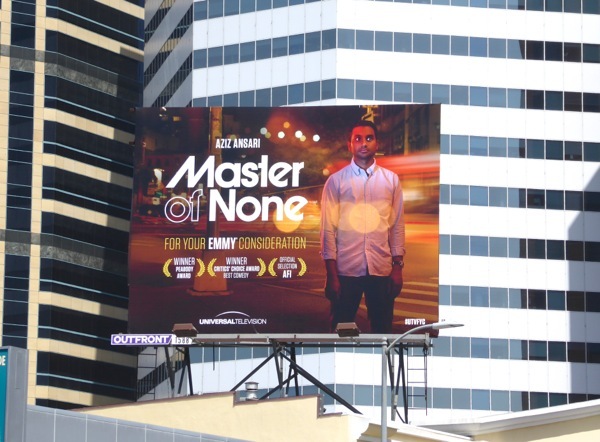 Jack of all trades, master of none. In his new ten-episode binge-worthy comedy, he plays a 30-something actor named 'Dev' living in New York City, making his way through his personal and professional life, but mastering none of it. 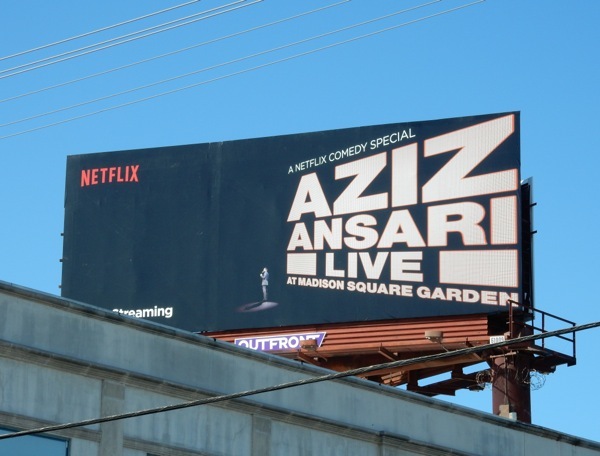 Playing the son of Indian immigrants to America the dramedy insightfully tackles cultural and racial issues, whilst many of Dev's dating and auditioning experiences stem from real-life events making the series even more personal. 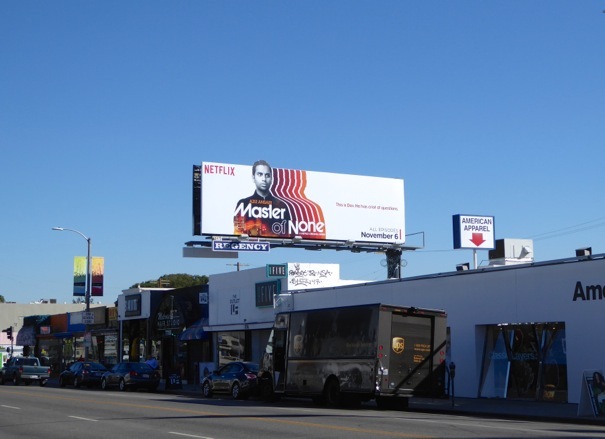 The series launch special extension billboard was first spied along Melrose Avenue on October 29, whilst the standard billboard was snapped at La Brea Avenue and Pico Boulevard on November 5, 2015. 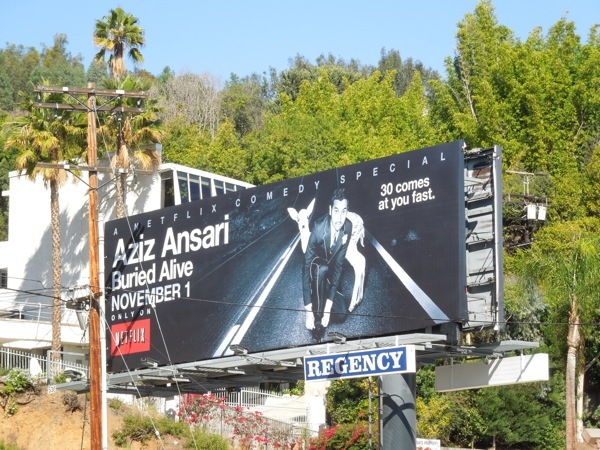 If you're a fan of the funny guy who created and stars in this new show, as a special bonus here's also two Netflix comedy special billboards, one snapped along the Sunset Strip on November 1, 2013 and the other above Beverly Boulevard on March 7, 2015. 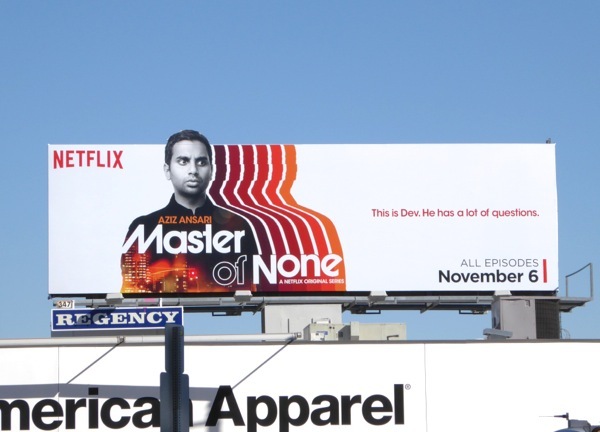 The title of the show may be Master of None, but it looks like Aziz Ansari may have mastered funny with this new series. 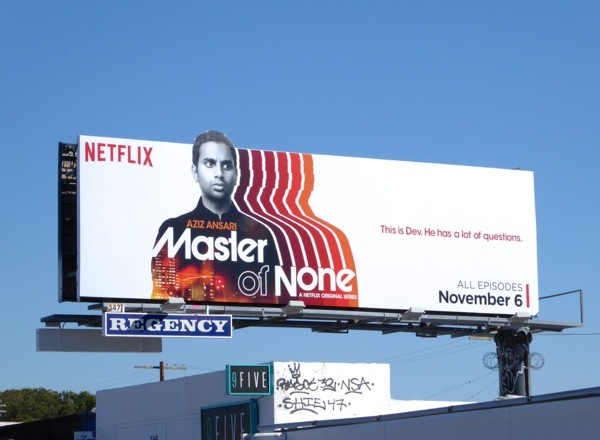 UPDATED: It's awards season in L.A. and it looks like Master of None is getting some Emmy support from both its production company Universal Television and streaming partner Netflix. 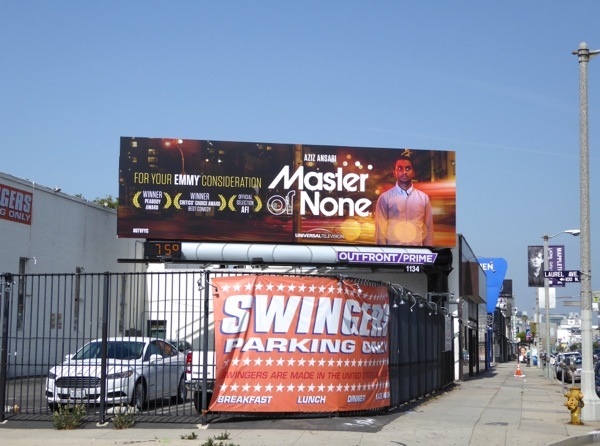 These Emmy consideration billboards were spotted along Beverly Boulevard, Westwood Boulevard and the Sunset Strip from June 2 to June 6, 2016. 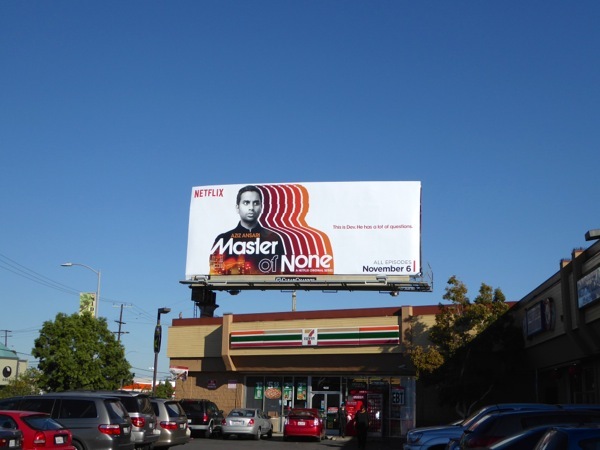 Let's see if this combined outdoor ad campaign will help garner some awards nominations for the show's inaugural season on Netflix. 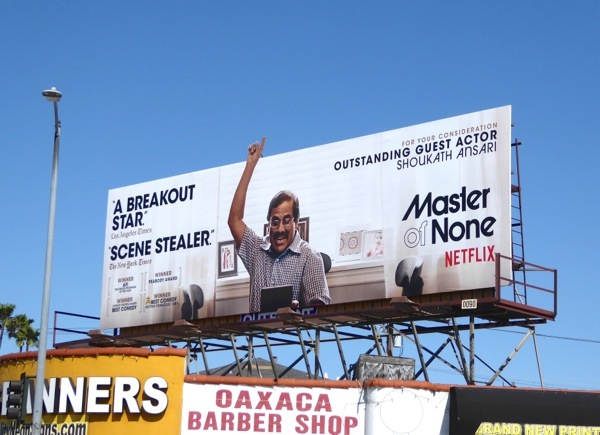 UPDATED: Here's also another fun billboard for the Netflix show, this time for the guest actor category for Shoukath Ansari, the comedian's real-life dad (who plays one of his on-screen parents opposite his real-life wife). 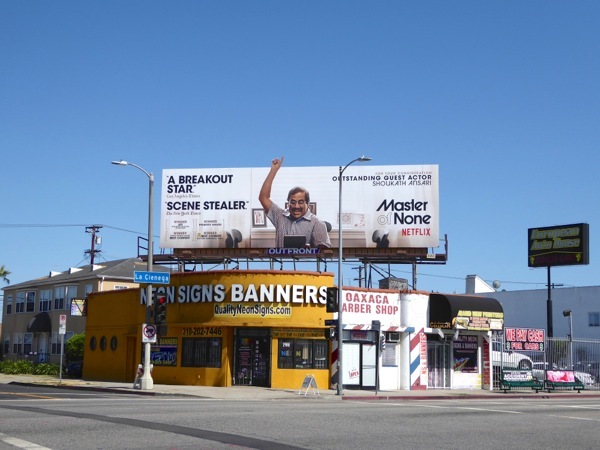 This scene-stealing billboard was spotted along L.A.'s La Cienega Boulevard on June 19, 2016. 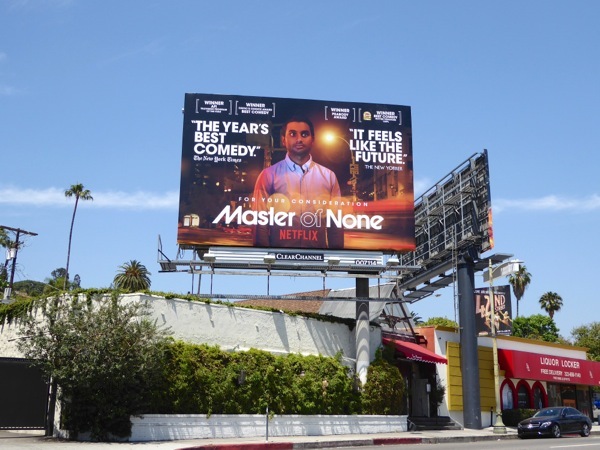 UPDATED: Congratulations to Master of None which received four Emmy award nominations for its freshman season. 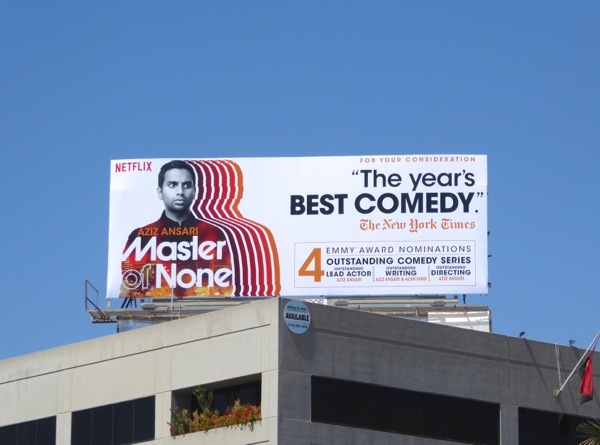 Here's the Emmy nomination billboard adapting the show's launch key art to help garner TV Academy votes snapped high above San Vicente Boulevard on August 11, 2016. 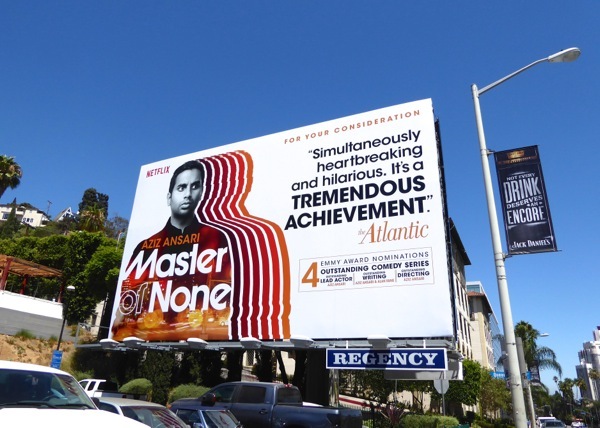 In addition to the ad creative with The New York Times "The year's best comedy" quote, here's also a billboard with The Atlantic's "tremendous achievement" quote, spotted along the Sunset Strip on August 15, 2016.